In an era where WWE’s recognition towers so far above that of any other wrestling company, it’s hard to to get an idea of how the popularity of the industry leader is trending. Arguments online can be anecdotal echo chambers. A study of WWE’s television viewership alone is complicated by the notion that all TV viewership is on the decline, and the product is easier than ever to follow through media other than linear TV. Even a review of company finances is skewed by the guaranteed and escalating TV rights fees WWE receives from broadcast partners like USA Network parent NBCUniversal, which have exploded even as viewership of Raw and Smackdown have declined. The brand split and move of Smackdown to airing live on Tuesday improved Smackdown’s viewership. Since then, viewership of both Raw and Smackdown have deteriorated worse than that of the top 25 cable networks. Between Q1 2015 and Q1 2018, Raw’s rating fell 24%. Over that period, USA Network fared worse, dropping 30%; the top 25 cable networks fared better, though, dropping only 14%. Between the same three-year period, Smackdown fell only 4%. That was the before the brand split and move to airing live on Tuesdays which began in Q3 2016 and improved viewership. Between Q3 2016 and Q3 2018, Smackdown fell by 12% in the brand split era. Over that period, USA Network held up better, dropping 7%; the top 25 cable networks also declined 7%. This data supports to the notion that WWE viewership is declining more quickly than television overall. However, high rankings for the programs remain steady. Frequently asked question: But is viewership from streaming platforms like Hulu and Sling counted in these viewership measurements? Yes. Streaming broadcasts of programs like Raw and Smackdown contain a signal that can be detected by Nielsen equipment. The data from Showbuzzdaily referenced here source Nielsen reports. But what about YouTube and Facebook clips? These signals would likely not be detected in short clips of those programs that are available on YouTube or Facebook and largely viewed on mobile devices or desktops, though they might be picked up if viewers watch the clips on a television. According to data sourced from Showbuzzdaily, both programs remain highly ranked compared to competition from other cable shows on their given night. Each hour of Raw is still ranked about where it was a few years ago. Again, Smackdown has benefited from live broadcasts with an exclusive roster due to the brand split. Also beneficial was from the move away from Thursday to Tuesday, and the move from Syfy to the higher profile USA Network. Likely due to those factors, Smackdown is ranked more highly now than it was a few years ago. Maybe there are factors other than a genuine decline in popularity contributing to the disproportionate loss in viewership. After all, the company vigorously pushes its storylines, characters and brands online in various forms of social media, its official website and with free online video. To give the benefit of the doubt, it’s possible popularity isn’t decreasing and the fact is merely that more fans are engaging with the company through other forms of media. Furthermore, stable rankings suggest WWE’s popularity is stable, though not increasing. In an increasingly complex wrestling industry that connects with and generates revenue from consumers in ever more diverse ways, we can consider TV viewership just one piece of a puzzle that makes up a total picture. Average paid ticket sales show a consistent decline across each quarter for the last three years. That’s true for both international events and the more regular North American (includes U.S. and Canada only) business. WWE runs many of the same venues in the U.S. and Canada year after year. This data accounts for main roster events only and includes both televised and non-televised events. Data collected from the Wrestling Observer Newsletter and cagematch.net suggest Q4 2018 might be up over prior years’ Q4s. 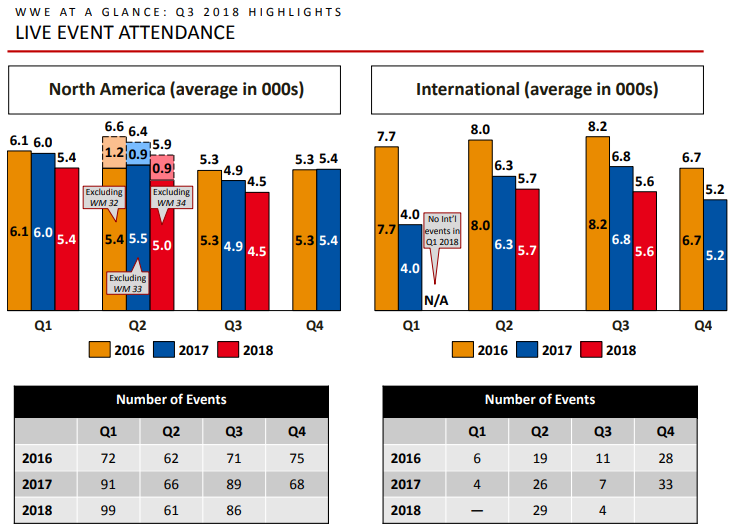 However these data showed flat attendance in Q3 when WWE’s actual reporting (see above) showed attendance down. 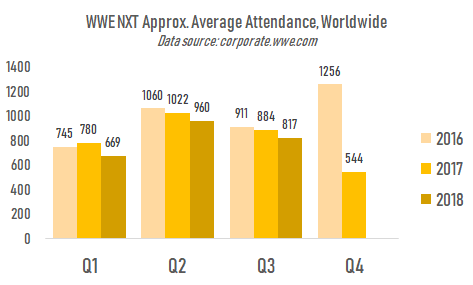 Average attendance for NXT events is down also. The discrepancy in the graph below in Q4 comparisons however is driven by a Europe tour that wasn’t repeated the following year. These averages include the smaller Florida shows that are run on a weekly basis as well as NXT’s playing of larger venues domestically and internationally. Through the first nine months of the year, total event revenue for NXT in 2018 ($5.8 million) was just above that of 2017 ($5.1 million) and well above 2016’s total ($4.1 million). The financial numbers below account for all WWE events, both main roster and NXT. 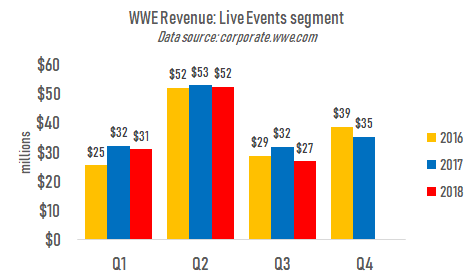 It’s worth noting as attendance slides, WWE’s ticketing business is flirting with being a money-loser. In Q3 the segment reported a loss of $1 million on revenues of $27 million. Considering Q4 2017 was also barely profitable, it’ll be interesting to see if Q4 2018 is profitable for the segment. The company will report on February 7. This is the case even as ticket prices increased over the last several years. Even when adjusting for inflation, a ticket sold in 2011 was on average $13 more expensive in 2017. NXT’s ticket prices increased more rapidly. 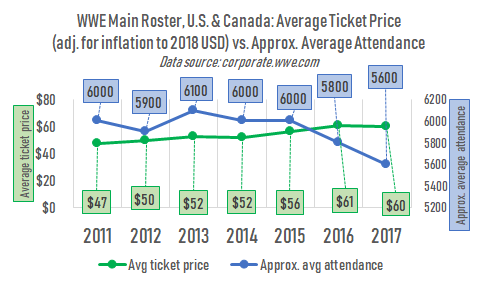 In January to September comparisons available, the average NXT ticket price rose form $31 in 2016, to $41 in 2017, to $44 in 2018. Again, that’s across events both in the Florida loop and the national/international tour. Ticket sales are WWE’s oldest business and have long been considered an indicator of popularity. While it’s no longer the company’s most important segment, its ability to sell tickets to fans is suggestive of wider interest. Overall, considering declines in attendance across time, a study of WWE’s live event business contributes slightly to the idea that popularity has waned in recent years. Still, this information can be taken into account with other metrics that give a fuller picture. First nine months of the year comparisons show online merchandise sales are up 7% in 2018 compared to 2016. 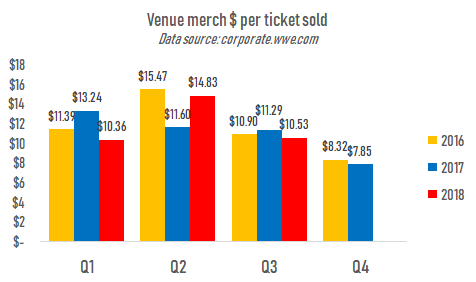 Merchandise sales were higher online than at venues in most quarters since the beginning of 2016, the exception being Q2 which benefits from high merchandise sales at and around Wrestlemania. As discussed above, attendance is down somewhat. But total attendance in nine month comparisons is actually only down 1% in 2018 compared to 2016. At any rate, we can adjust for changes in attendance by dividing venue merchandise revenue by total attendance. In that case, venue merchandise dollars per ticket sold is down slightly across quarterly comparisons. It’s also down in the first nine months of 2018 ($11.98) by 6% from the first nine months of 2016 ($12.76). 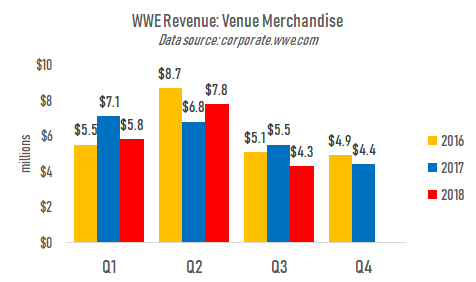 Data on merchandise sales, particularly venue merchandise sales, slightly support the notion that WWE popularity has decreased. Sales online though aren’t trending downward over the same time period, were up in Q1, flat in Q2 and down in Q3. 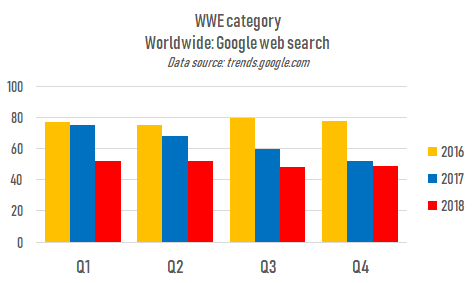 Queries worldwide for WWE and related subjects have declined consistently in each quarter since a peak in 2016. 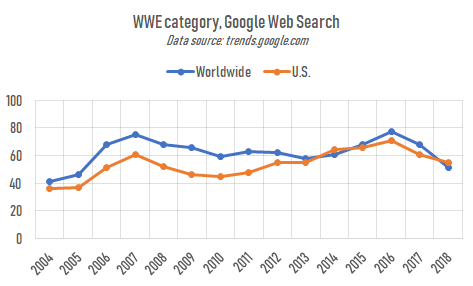 The same has been true of searches coming from the U.S, WWE’s home market. Google Trends doesn’t provide any absolute numbers of searches, but instead shows data on a scale standardized to 100. According to Google this data is adjusted for overall volume of searches in general, and should account for the overall increase in use of Google searches over these years. This data supports the notion that interest in WWE has declined somewhat since 2016, both in the U.S. and worldwide. Worldwide searches haven’t been this low since 2005. U.S. searches however were still higher in 2018 than they were in years 2009, 2010 and 2011. 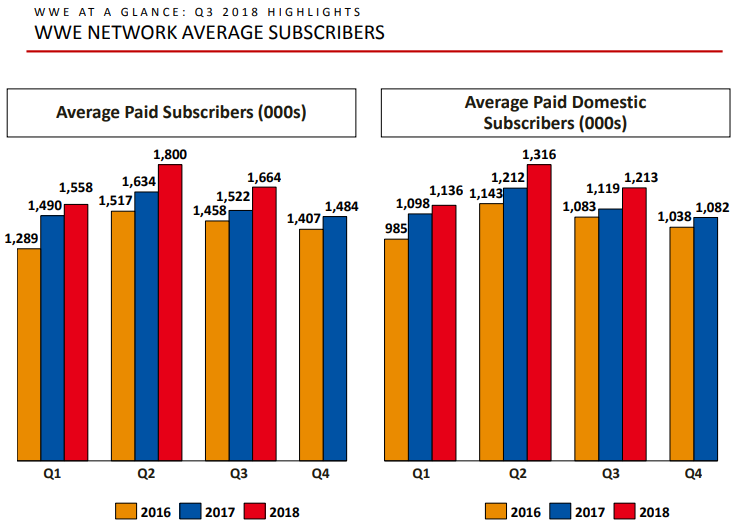 Subscriber growth for the WWE Network continues to rise in each and every quarterly comparison throughout the now five-year history of the subscription video streaming service that airs all of the company’s pay-per-view events. Reliable projections the company provides between quarters makes subscriber growth predictable to investors. WWE projected Q4 2018’s average paid subscriber number will be 1.56 million, again up from the Q4 of the prior year. Five years into the life of the Network, and it’s not clear the subscriber metric reflects a growth in annual popularity. 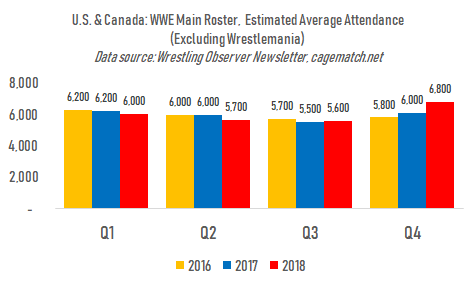 Certainly it reflects a disproportionate and expected peak of interest around the time of Wrestlemania, which occurred in Q2 each of the last three years, with subscribers reaching their high point in that quarter and declining afterward. With the streaming service being reliant on technology like broadband access and streaming devices, it’s likely those technologies have yet to sufficiently saturate the markets that significantly affect subscriber totals. While broadband is relatively normal in markets like the U.S., U.K. and Canada, access is still emerging in places like India. 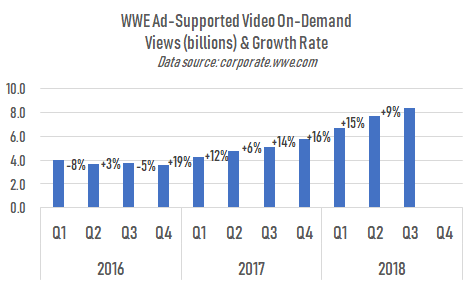 Even in WWE’s western markets, consumers are probably still growing more accepting to the streaming technology needed for the Network. Due to the emerging technology involved, it’s doubtful the Network is a strong measure of product popularity. Nonetheless interest in the product is strong enough that the Network is still growing its subscriber base and posting consistent year-over-year growth. It may become such an indicator after we see a quarter with a domestic average paid sub number lower than that of the same quarter of the prior year. 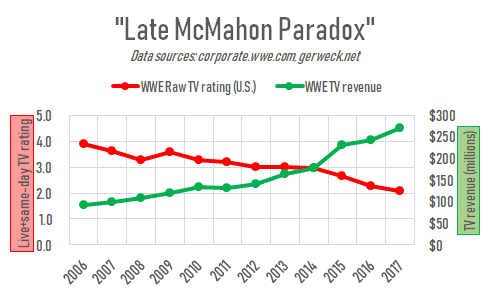 The Network’s growing subscriber totals don’t support the notion that WWE popularity has declined in recent years, and slightly supports an opposite notion. Time spent viewing WWE video on various online platforms like YouTube and Facebook continues to grow with no end in sight. WWE remains one of the most popular channels globally on YouTube. Video views, different from time spent viewing, continues to grow too. Both metrics have grown at double-digit rates of percent from quarter to quarter. 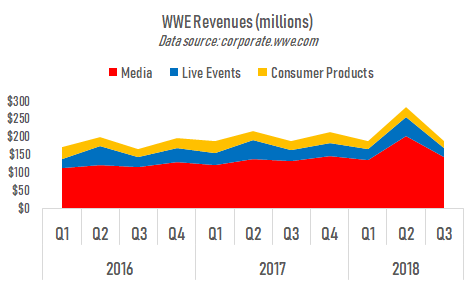 The money WWE receives from this kind of consumption is low compared to revenue from traditional TV. The full year of 2017 was the last time the company reported on its Digital Media segment. The segment reported $34.5 million in revenue, a figure that includes YouTube money but also sales of advertising on WWE.com. YouTube revenue is now more obscured in the “Other” media segment along with larger pieces of revenue like TV rights to reality programming Total Divas, Total Bellas and Miz & Mrs, as well as money from the company’s deal with the Saudi Arabian government. It should be noted WWE received a rights fees from Facebook for seasons of Mixed Match Challenge, likely worth several million. 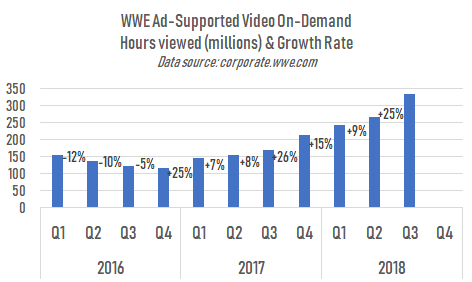 Growth in hours spent viewing and in views of WWE content online may support the notion that product interest is actually growing and not support an argument that interest is decreasing. It’s plausible however this data is actually most reflective of a habitual change in how wrestling fans are consuming wrestling content in recent years. To report its social media follower totals WWE sums its followers on all branded accounts as well as the accounts belonging to talent. So these followers are non-unique, as followers who follow more than one WWE-associated account are no doubt counted numerous times. Having an ever-growing talent roster might help these totals. Whatever the case the company continues to inch toward the 1 billion follower milestone. Facebook growth for WWE largely stalled in 2018. 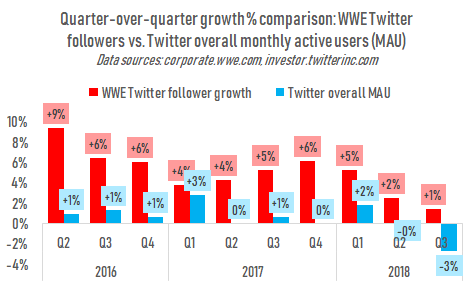 Twitter follower growth is slightly stronger, and WWE’s growth on other platforms (not broken out, probably largely Instagram) is strongest. 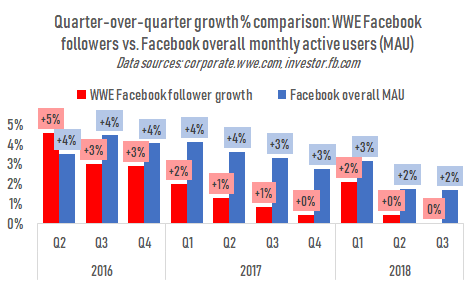 Even as WWE’s growth on Facebook slows, its rate of follower growth is mostly below the rate of growth in the number of people using Facebook in general. Much of Facebook’s overall growth in this metric however is outside of the U.S., WWE’s home market. On Twitter, home of niches both fun and horrifying, WWE outpaces the platform overall. 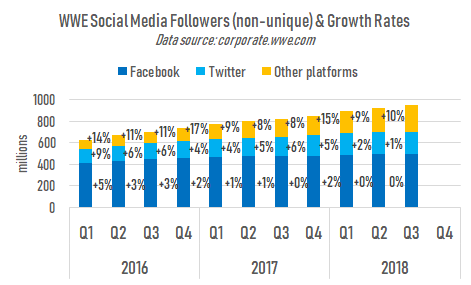 Even when monthly active users on Twitter fell by 3% in Q3 2018, WWE’s follower count was up 1%. WWE’s performance on social media, another emerging global technology, doesn’t support the notion that the company’s popularity is decreasing, although stalled growth on Facebook isn’t indicative of a brand on the upswing. Disproportionate growth on Twitter may somewhat offset the concern about Facebook, but with Twitter being a less active platform than Facebook by about 7x (about 326 million active users versus Facebook’s roughly 2.3 billion), arguably not completely. Above we looked at seven different metric types, thinking about WWE popularity. Let’s go through each one and ask: Does it support the notion of an increase or decrease in popularity? TV viewership: Decrease. Raw has fell harder in recent years than the top 25 cable channels. Smackdown was boosted by the brand split in July 2016 but has also fallen harder than top 25 cable since then. 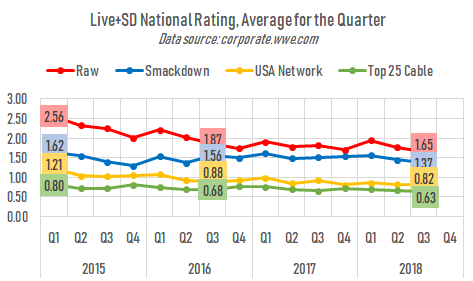 While WWE TV viewership should be viewed with a comparison to the rest of the TV landscape, the “but all TV is down” objection doesn’t hold weight under the data here. Ticket sales: Decrease. Paid attendance to main roster events show a consistent downward trend. Even NXT attendance is trending downward, although rising ticket prices have allowed NXT live event revenue to increase at the same time. 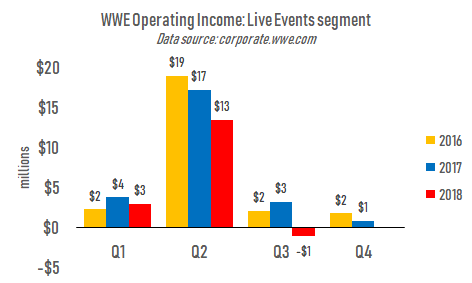 Meanwhile the Live Events segment for the entire company struggles to be profitable in some quarters. Merchandise sales: Slight decrease. Venue merchandise sales are down somewhat, even when adjusting for the decrease in attendance. Online merchandise sales seem to be doing fine though. Web searches: Decrease. 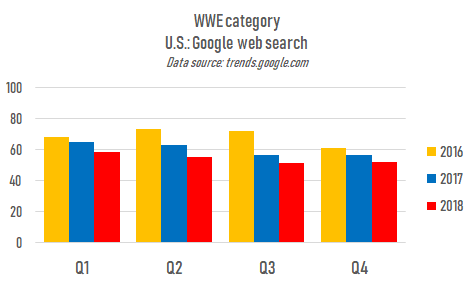 Google web searches are consistently down over the last three years, both worldwide and in the U.S.
WWE Network subscriptions: Increase. Without context about growing consumer acceptance of subscription streaming services the consistent year-over-year increase in subscriptions in each of the four quarters suggests an increase in company popularity. Free video viewership: Increase. 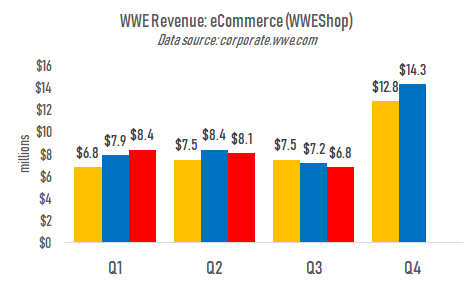 Views and time spent on free WWE content online is definitely increasing, as one would expect to find if the company’s product was genuinely becoming more popular. This trend may also reflect a shift in consumer behavior with regard to new media. Social media followers: Increase. Again, without context, WWE’s growth on new media platforms is increasing. Yet the lack of growth on Facebook is concerning. These are the seven best metrics to my knowledge to study to get a read on WWE’s current popularity. While the company certainly isn’t showing any signs of becoming so unpopular that it’s any kind of immediate financial concern, I believe the data here reflects a genuine but moderate decrease in popularity over the last three years. Paradoxically the company is in better shape financially than ever. Big new TV rights deals signed with NBCUniversal for Raw and Fox Sports for Smackdown basically guarantee the company increasing revenues for the next five-years. The shift in the media landscape to put increasing value on live content like Raw and Smackdown will keep the company strong even if ticket and merchandise sales fall. Supplanting the old pay-per-view business for a subscription streaming service also allows for more consistent and predictable finances. Why WWE popularity has slipped is a more contentious question, and one with less data to use to answer. I would argue the factors are largely a lack of star creation; programming that feels inauthentic, with underdeveloped characters and inconsistent storylines; the fostering a lack of goodwill with fans, the remainder of whom, in another paradox, stay ardent and willing to spend more per capita on company products. All of which is perpetuated by the company’s aforementioned fiscal security, which allows executives to avoid an economic incentive to enact changes that might increase popularity and ultimately even further improve company finances.